Info "Keep the paper airplane in the air!" Paper Trail is one of Kat and Ana's microgames in WarioWare: Smooth Moves. "The Sketch Artist" form must be used when playing this game. The objective in this microgame is to guide the paper airplane through a straight obstacle course. 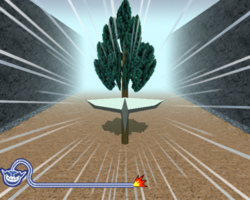 Hitting into a wall or the tree in the center of the stage will cause the game to end in a loss. 1st level difficulty: The area is very wide and is easy to get through. 2nd level difficulty: The area is a little thinner. 3rd level difficulty: The area is at its smallest point. This page was last edited on February 19, 2018, at 17:43.